Pumpkin spice cinnamon rolls for two! 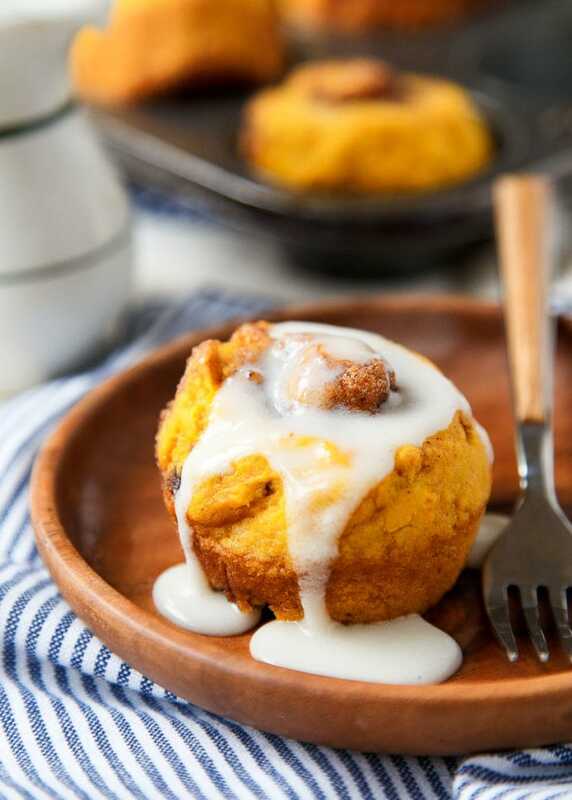 These pumpkin cinnamon rolls are quickly made in a muffin pan without yeast! I’m fully ready for Fall, and I’m armed with this recipe for pumpkin spice cinnamon rolls made in a muffin pan! The recipe makes just 4 cinnamon rolls, and they’re made entirely without yeast! They’re based on my small batch cinnamon rolls that are just plain cinnamon. The addition of pumpkin makes them even better! I can’t be the only one who types ‘pumpking’ every single time, can I? I think it’s fitting, though–pumpkin is the king of fall. So, when a request for a pumpkin spin-off of my no-yeast cinnamon rolls came in, I skipped in the kitchen and got to work. I hardly need an excuse to play with that recipe; it’s so easy and fun to work with. I can pull this dough together 8 minutes (I timed it), but that’s only because I’m not one of those people that gather the ingredients before hand. I should be one of those people, but I’m just not. It takes a tiny bit of skill to them gently roll the dough out into the rectangle, but then a quick drizzle of butter, a sprinkle of the spice mixture, and roll, roll, roll. Slice into 4 rolls, pop into muffin tins, and bake! It couldn’t be easier to stuff a cinnamon roll in your face. 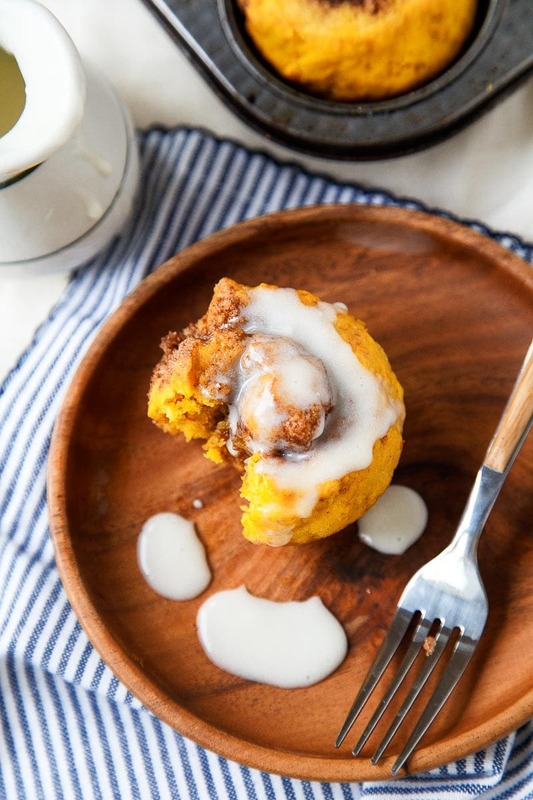 These pumpkin cinnamon rolls are packed with pumpkin, but they also taste like pumpkin pie, because the cinnamon-sugar filling mixture also has a big dose of ground cloves and ginger. It really makes it taste like pie. And I really like it. I can’t remember which readers requested these rolls, but here ya go! I hope you love them as much as we do! I’ve heard that if you drink a cup a pumpkin spice latte while eating pumpkin spice cinnamon rolls, you’ll have good luck all Fall long! The muffin pan I use is vintage, and I love it because it only has 6 cups! But, if you’re lacking your grandmother’s vintage small muffin pan like me, here’s a great substitute! Combine the flour, 1 tablespoon of the sugar, baking powder, baking soda, and salt in a medium bowl. In a small measuring cup, combine the milk, pumpkin, vinegar, and 2 tablespoons of the melted butter. Heavily flour a work surface, and pat the dough out into a rectangle about 6" long. Use plenty of flour as you go. Pour the remaining 2 tablespoons of melted butter on top of the dough. Combine the brown sugar, cinnamon, cloves, ginger and remaining 1 tablespoon of granulated sugar. Press this mixture lightly into the butter on top of the dough. Carefully, roll the dough up starting with the long side. Roll away from you. When you get to the end of the dough, pinch the entire seam shut. Meanwhile, stir together the powdered sugar and cream. Add enough cream to achieve a pourable consistency. When the cinnamon rolls come out of the oven, drizzle with frosting and serve. 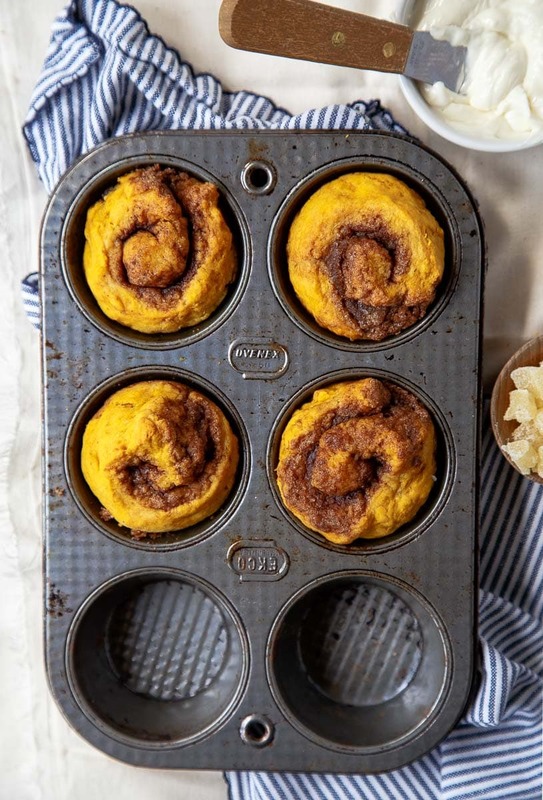 These look perfect…I was almost tempted the other day to buy pumpkin cinnamon rolls in the tube but I didn’t and now I’m so glad I didn’t…I’m definitely going to try to make these. When I hear ‘quick’ and ‘cinnamon rolls’ in the same sentence, I’m so in. Cinnamon rolls are my husband’s weakness, and let’s be serious, something I can’t resist either, and I’m always down to find a quick, unique way to make them. Love! Oh yes!! Whoever suggested this – THANK YOU. This is the best idea I’ve heard lately. Pumpkin rolls, I’ll see ya Saturday morning. And I’ll be drooling until then. 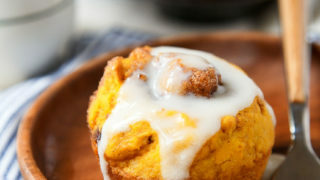 Quick pumpkin cinnamon rolls (I swear I DID almost type “pumpking” since you put the thought in my head!)? Why yes, I think I will. These look SO good! Plus, Pumpking is an awesome beer (I do that, too). These look seriously heavenly! These look fabulous. I love your desserts for two; there are no leftovers to gorge oneself on afterwards, and yet there was a lovely dessert to end the day. Keep baking! Christina…..love this recipe! Thank you! I would like to increase it to make six and fill the pan…I just hate to see two empty spaces when it means we could have a bonus of two additional treats. How would you increase the ingredients to make this work? Looks like you may be increasing your recipes a little in the near future since you have a percious little one now…..desserts for three! Christina, these look GREAT! Can’t wait to make them when my boys come home again. Too dangerous to have around for just me (my husband is diabetic, so a no-no for him). I also wanted to share that I gave both of your cookbooks as a wedding gift a couple of weeks ago. I hope the bride and groom appreciate them as much as this empty nester does! Love how easy these cinnamon rolls are! Perfect for fall brunch! Yumm! I do love cinnamon rolls but they are a lot of work. Recipes like this could be dangerous! I do the same thing when typing “pumpkin!” Then again, I also type “arugular” pretty often, so maybe I just have a problem…haha. I love how quick and easy these come together! Must give them a try. These look delicious! Is that a standard-size muffin tin or one that makes super-size muffins? I really do try very hard to be better at my mis en place, but I almost always fail. In the end, I could kick myself for not being more prepared. These are some damn fine cinnamon rolls. Pinned. I made these, this morning! They were wonderful! I hesitated a moment when rolling them. I wasn’t sure how thick the 6 inch rectangle should be . . . but then I used my judgment, and left it maybe 1/4 inch thick, and they turned out just great. I will do these again, or maybe try the plain cinnamon rolls for a change. Thanks! Oh my heavens. So delicious. I’ve made them twice now. Give me these over a donut any day!! Tonight came home from work and my neighbor had raked my leaves, so I whipped up a batch and walked it on over. Thanks for sharing this fall delight. Could I by any chance make these a day in advance. Refrigerate in the muffin pan, and bake the next morning for breakfast? Do you think you could refridgerate them overnight in the pan and pop them in the oven in the morning? These look wonderful! Do you think they would freeze well, either pre or post bake? Thanks so much! I haven’t tried it Meg. Something tells me no. Maybe freeze before baking? Ok, thanks. I’ll let you know if I try it pre-bake! Is your muffin pan the larger size? Instead of regular sized? It’s regular sized. Sorry for the confusion! Thank you for sharing this recipe. My human made these this morning and they are perfect for a small family. Light, fluffy, delicious. We increased the cinnamon to 1 Tbsp and added small amounts of cloves, nutmeg and allspice in place of ginger. 1/8 tsp each. Absolutely amazing. I’ll be posting a picture of them balanced on my head tomorrow :) @jumpforjoysf on instagram. My husband and I really enjoyed these for dinner tonight. Earlier today I had baked up some of the pumpkins we grew this year, so I used fresh pumpkin in the recipe. I used whole wheat flour instead of all purpose flour. This recipe is a keeper. Hi is there a recipe for cinnamon rolls using baking powder instead of yeast? There is! It’s called Quick Cinnamon Rolls.